The bottom line is that Israel raided these ships with commandoes, and the end result was a great deal of needless bloodshed. And apparently, according to the IDF spokesperson, as reported by journalist Gregg Carlstrom, they couldn’t even wait to do it until the ships had passed out of international waters, which makes it, if no explanation is forthcoming, an act of piracy as well. Israel crossed a line today, in a way not dissimilar (though certainly of a much smaller scope, thankfully) to the line they crossed in their massive attack on Gaza in 2008-09. Whatever Israel’s detractors have said over the years, this incident, like Operation Cast Lead, was far beyond anything Israel has done in the past. This was a shocking massacre, and there’s no way to pretty that up. These were people engaged in direct action of civil disobedience. True, the siege on Gaza should simply be lifted, but being that it’s there, yes, Israel can be expected to take action to stop the flotilla. But this doesn’t just go above and beyond and justification, it zooms light years past it. Many of the International Solidarity Movement activists living in Gaza gave interviews with the press, including Bianca Zimmit, an activist from Malta who was shot in her thigh by Israeli troops during a demonstration against the buffer zone last month. Here’s the link to a previous blog post I wrote about this incident and here’s the link to a blog post I wrote about a Palestinian demonstrator who was killed the week after Zimmit was shot. It doesn’t matter if the activists were armed — I’m pretty sure they were, to some degree. It doesn’t matter if they were entirely pacifist in their behavior — I’m pretty sure they weren’t. It doesn’t matter if they were planning for an armed confrontation, or merely fairly certain it might happen, or even if they were naive enough to think that when Israel turned them away (I’m pretty sure they knew they wouldn’t get to their destination) that it wouldn’t involve violence. What matters is the blockade they were symbolically trying to break. What matters is the roughly 300,000 refugees in Gaza who live in abject poverty — a 200% increase since early 2007, according to UNRWA — because of Israeli policy. What matters is the fact that many of the 1.4 million people living in Gaza must make do with 8-12 hours a day without electricity — up from 6-8 hours before the start of the year — because of Israeli policy. What matters is the “ongoing deterioration in the social, economic and environmental determinants of health” that the World Health Organization wrote about in January (back when people were still only dealing with 6-8 hours of daily power outages) — including 27 people who died while waiting for permission to leave Gaza to receive treatment — because of Israeli policy. What matters is the blockade — what matters is the occupation. This entry was posted in Gaza, Human Rights, Israel, Palestine on May 31, 2010 by Rabbi Brant Rosen. Looking at these reports and then looking at a website for a fancy Gaza “Roots” restaurant and an Olympic swimming pool and reports of hundreds of “things” of humanitarian aid including building materials for a hospital, grants of passage for medical aid, etc. by the Israeli sites – how are we to sort out what is true and what is exaggeration? We have poor sections of our cities, too, and this is our shame – how do we sort the truth from fiction these days? Gaza’s economy has been devastated by two intifadas against the Israeli occupation, by the 2007 civil war between Hamas and Fatah, by last year’s war between Israel and Hamas, and by the continued Israeli blockade. I’ve met no one who is starving here (most Gazans receive staple foods from UNRWA) and many items forbidden under the blockade—including cement— come into Gaza through the tunnels. Most Gazan families cannot afford the smuggled luxury items, nor can they afford a meal at the Roots Club. While the specific numbers are disputed, the unemployment rate is astronomical. Those who do work usually share their income with their extended families. Many, including children, have resorted to dangerous, back-breaking work ferrying goods through the tunnels or collecting rubble from destroyed, unstable buildings. Among the highest paying jobs are those with the alphabet soup of NGOs and development organizations currently operating in Gaza. There is a housing crisis in Gaza. Everywhere I go, I meet people whose homes have been destroyed by Israel and not rebuilt. Some moved in with relatives and live in cramped quarters. Others rent apartments that they can barely afford. And many, including the three sisters pictured above, live in partially destroyed houses. And it should go without saying that there is a crisis of psychological trauma in Gaza, particularly following last year’s war. However, a minority in Gaza—including me—do live in comfortable apartments and dine in Gaza City’s coffee shops. My one-bedroom apartment came with a fully furnished living room and bedroom, a satellite television, wireless internet, electricity, and a hot water tank. It had not been rented in over a year when I moved in, I signed no extended contract, and I pay only $300 per month. Since the power goes out in my building (and across Gaza) for at least eight hours per day, I’ve purchased an electric generator that gives me electricity whenever I need it. Most Gazans cannot afford these generators and have structured their lives around the electricity schedule. Some Gazan children have died when faulty electric generators smuggled from Egypt overheated and exploded. For an accurate assessment of exactly what kinds of materials are getting into Gaza, I recommend Gaza Gateway, which provides up-to-date information and commentary on the situation at the Gaza Strip border crossings. Gaza Gateway is updated weekly and allows visitors to easily access credible information about the amount of traffic that Israel allows to pass through the Gaza Strip border crossings. The data is presented alongside relevant background information, such as the amount of goods allowed through relative to the needs of the population of Gaza. It is an essential source of information and an important counter to the kinds of misrepresentations that you cite. Thank you for setting me straight on the “details” that were circumvented. It’s those details that always manage to make things seem what they are not. I wasn’t aware of the Gaza Dispatches which I will use as a better guide to facts. “Haneen Zuabi, a Palestinian member of the Israeli Knesset, has been sworn at by parliamentary colleagues and received death threats since disembarking on Monday. While other activists from the Gaza aid flotilla have returned home, one is left facing death threats and abuse in Israel. 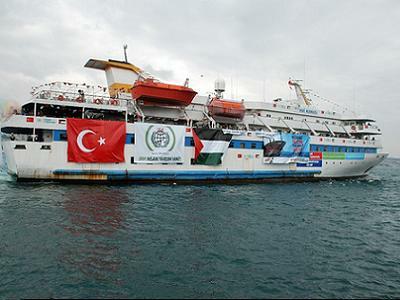 Haneen Zuabi, a Palestinian member of the Israeli Knesset who was aboard the Mavi Marmara, is now under armed protection after nearly 500 people signed up to a Facebook page calling for her execution. During a heated parliamentary session yesterday Zuabi was sworn at and then shoved out of the chamber amid shouts of “Go to Gaza, traitor”. Regev tells Zoabi: Go to Gaza, Traitor !!! His closing comments are so true. Jon Stewart might just have the makings of a righteous Jew. It does not matter whether or not the fancy restaurant in Gaza has lots of customers, the main point in the matter is that they are getting supplies. I’m sure they’re not serving dirt pies. As the man said they serve the best food around, in order to prepare the best food daily, one needs ingredients, you know, actual food, meats, produce, water, etc. In order to build an Olympic size swimming pool, one would need building materials, like cement, and plenty of water. Stop harping on this one restaraunt and read any number of impartial NGO reports about the level of humantarian distress being experienced in Gaza as a direct result of Israel’s blockade. Read Gaza Gateway for accurate assessments of the amount of essential goods allowed into Gaza relative to its basic needs. With all due respect Rabbi, I posted one time on the issue, I would hardly call that harping and just to let you know I make it a point to look at all sides as well as any I can find that “I” feel are impartial. “if you walk down Gaza City’s main thoroughfare — Salah al-Din Street — grocery stores are stocked wall-to-wall with everything from fresh Israeli yogurts and hummus to Cocoa Puffs smuggled in from Egypt. Pharmacies look as well-supplied as a typical Rite Aid in the United States. Do I believe the people in GAZA are having hard times because of the situation there? Yes of course but, the extent at which I see many portray I feel is what is questionable. There are poor areas and people in Israel as well, there are poor people everywhere. It is hardly an secret the number of those who wish to see Israel destroyed,I am not sure what people expect Israel to do? Should Israel not protect herself, her people, her children? You tell me Rabbi, how is she suppose to keep her people safe, when they won’t stop? Look at the number of Arab and Muslim countries that surround them, why do they not get together and help those people? Why did Egypt not receive as much criticism as Israel for blocking their border? Maybe if the Palestinians would give up their politics of self destruction, this would stop. HAMAS doesn’t care about them, they know if peace would come to their people that would put them out of business, they don’t want to live in peace with Israel, they don’t want Israel to exist at all, nor do many of the others that surround her. They need for the Palestinian people to remain as they are so that they can continue to use them against Israel. They will never agree to exist in peace with Israel. So please Rabbi, again I ask, what is it Israel can do, if the others will not change their ways? I apologize to you for using the dismissive word, “harping.” I suppose it reflected my frustration that I’ve been writing consistently – and, I believe clearly – about the humanitarian situation in Gaza. What I really meant to say to you is that we should not use the example of one affluent restaurant as somehow indicative of Gaza’s overall condition. I’d say further, it’s highly misleading to see the situation in Gaza City as representative. Ashely Bates addresses this issue head on in her posts from Gaza. I highly recommend reading her blog, Dispatches from Gaza, which I believe offers a much more complex portrait of life in Gaza than you will read in the mainstream press. (In) Gaza City’s affluent seaside neighborhood, life looks much easier. Electric generators in high-rise, elevator-equipped apartments ensure 24-hour electricity for those who can afford it. Coffee shops and some fancy restaurants cater to the elites, many of whom work for international development organizations. Down at the Gaza City fishing port, however, signs of affluence disappear — the harbor is littered with abandoned boats but the Hamas government recently cleared war debris and installed outdoor lighting in anticipation that the aid flotilla would make it through. Despite its once-thriving fishing industry, Gaza is now a “net fish importer,” according to the Associated Press. Fishermen who exceed the three-nautical-mile blockade in search of deeper water and better catches are fired upon by Israeli gunboats. Mahfouz Kabariti is a former Gazan fisherman who converted his vessel into a tour boat for schoolchildren because he found it impossible to earn a decent living. He hopes his new business will bring some joy to a traumatized society. Other Palestinian entrepreneurs have opened “fishing farms” as a result of the naval blockade. Further south down Gaza’s coastline, the overwhelming stench of raw sewage in a seaside valley impels drivers to shut their car windows even on scorching hot days. About 120 million liters of semi-treated waste water gets pumped into the Mediterranean Sea every day, in part because Israel has prohibited the importation of spare parts, pumps and equipment needed for cleaning the water. “We had these problems before the siege, but not in the volumes we are facing now,” said Majed Ghannam, the Quality Assurance Manager at the Coastal Municipality Water Utility, which receives much of its funding from the World Bank. Hospitals across Gaza likewise report that they lack dozens of specialized medicines for patients. Following the flotilla tragedy, the World Health Organization put out a press release listing hundreds of items waiting to enter Gaza for up to a year, including CT scanners, x-rays, fluoroscopes, infusion pumps, medical sterilization gasses, laboratory equipment, and uninterrupted power supply batteries. Gazan patients who require medical treatment abroad must first get approval from the Fatah-controlled Ministry of Health. If this approval is granted and the treatment is arranged, the patient must either travel through Egypt, whose border is typically open only once a month, or through Israel, whose security clearance process for “nonemergency” medical cases can take months. During a typical week in May, Israel allowed in 637 truckloads ferrying 14,069 tons of food, medicine and other supplies. This is also highly misleading. Again, please read Gisha’s Gaza Gateway website, which offers accurate assessments of the amount of essential goods allowed into Gaza relative to its basic needs. You will read, for instance, that during the week of May 23-29. Israel allowed through 662 truckloads of supplies – but you will also learn that the required amount is 2,400 truckloads. To be sure, no credible agency is claiming that Gazans are “starving.” However, NGOs have long reported that approximately 85% of Gaza’s residents depend on humanitarian aid to survive, and that 10% of children under 5 in Gaza suffer from malnutrition. In other words, we need to look at these statistics in context. And we cannot simply look to Gaza City and the Roots restaurant to get an accurate picture of life inside Gaza. Yes, Katya, there are poor people everywhere. But the crisis in Gaza is directly the result of the political/military policies of Israel. If Israel lifted it’s crippling blockade tomorrow, this situation would change drastically. 4. The American government must vigorously engage both Israelis and Palestinians toward a just and peaceful settlement of this conflict. KAtya, Israel has a right to stop the import of weapons. But the import of chocolate, cement or paper. Come on….Where is your humanity? The 3 year blockade only feeds resentment for Israel not rapproachment. Use some common sense. The blockade is a disaster (apart from being a war crime – as the Goldstone Report identified). The blockade must end if there is to be peace. For an example how desperate the IDF is to justify the killings of the 9 people and assaults on scores of others see the following. The above links describe how the IDF released an ‘alleged’ audio transmission between the Israeli navy and the Gaza flotilla activists. The problem is the IDF got cught for fabricating it. The IDF alleges they ‘edited’ it. They then released an ‘unedited’ second version. You don’t have to be an audio specialist to hear the obvious fabricated comments. The IDF is digging itself into a hole. One last question, Is it your sincere believe if Israel lifted the blockade, if Israel put away the weapons and agreed to everything asked of them, with the exception of completely leaving, they would be permitted to live in peace, that they would stop trying to kill her children? That a Jewish state in the middle east would finally be accepted? Yes, this is my sincere belief. Egypt and Jordan found the wherewithal to live in peace with Israel. Syria came close to doing so as well on more than one occasion. As far as the Palestinians: the PA has long since accepted in principle the notion of a two state solution – and so has Hamas. I believe we owe it to both Israeli and Palestinian children to devote ourselves to pursuing a just peace in Israel/Palestine. To claim, as you do, that the Palestinian people “will never agree to exist in peace with Israel” means to surrender this region to a future of perpetual conflict and continued tragedy for both peoples. I did not specifically say all the Palestinian people themselves, I’m referring to those who have made it perfectly clear time and time again that they don’t wish to coexist with Jews in the Middle East. I have heard them with my own ears too many times to count. I’m not quite sure how much trust one should give to the words of a terrorist organization, which is what HAMAS is. As to the others, I’m not so sure how much trust should be given to their words either. I just read in the news Egypt will revoke citizenship of men who marry Israeli Jewish Women, doesn’t sound quite accepting to me. Don’t misunderstand me, I would love nothing more than to see peace between the two sides Rabbi. However, we can’t deny reality, at least I cannot. Not when you consider what’s at stake should your belief turn out to be wrong. Today’s “terrorist” organization is tomorrow’s legitimate political player. That was the case for the case for the PLO – and for that matter, it was the case for Menachem Begin and Yitzhak Shamir, who both belonged to the Jewish terrorist groups Irgun/Lehi and later became Prime Ministers of Israel. I am not denying reality to see that there is precedence for Israeli-Arab peace. (Yes, the peace between Israel and Egypt is not a perfect peace, but it is a peace nonetheless.) If we know from history that peace is possible, then we owe it to ourselves to continue to pursue it. Consider the stakes if we do not.